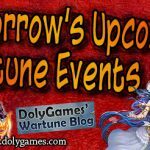 Hey everyone, in this article I share the Wartune Events for the 5th of February 2019 (article + video)(RES Synthesis, Mount & War Emblem Cycle). (looks like still missing)(once) War Emblem RES Reduction Levels – 3 days: Upgrade to the required levels and be rewarded. Once during the event. (looks like still missing)(once) War Emblem Levels – 3 days: Upgrade to the required levels and be rewarded. Once during the event. (looks like still missing)(once) War Emblem Resistance Levels – 3 days: Upgrade to the required levels and be rewarded. Once during the event. This has happened before in one of the event. There are no details about it and we can not find it either. How do you think these people. maybe we find it in a campaing. But good luck to find it……. I think R2 is clueless-I understand if they want us to work for it as a guild or even a server-But not even being told there is something to work for is pure idiocy. hey Cosmos, long time you don’t do a character overview. could you please do one? Haven’t had time to do videos lately but i’ll write a note and see if i can find time to do it.